TM reduces PTSD among active duty US Army, says new research… We are learning more about alternative treatments! 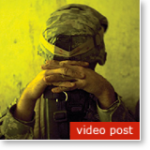 TM reduces PTSD stress… Quote from website article and video clip… Very powerful! There are very effective “off the couch” treatments… available for treating the symptoms of PTSD. Many of which I have written about in this blog and in my book. Although mental health professionals are the best resource for investigating treatment strategies, including use of prescription drugs, I tend to take human connectedness and mindfulness type treatments very seriously. My own use of writing as therapy has been amazingly effective, which is happening right now while writing this post… My most recent post is just one example of the value of mindfulness in the context of “vulnerability.” Taking a pill is easy, too easy, and there can be side effects that are not very agreeable. Just ask a survivor you know about their experience with prescription drugs, including using alcohol in the mix. Spend some quality time doing your own research and consulting with your primary care physician or mental health professional. Try finding the alternative treatment strategies that work best for your own needs. I found writing and engaging with others on the topic of life after trauma to be most effective. What have you learned along your own journey of healing? This entry was posted in Uncategorized on August 15, 2013 by stevesparks.